While Mini DV still remains the digital recording format of choice, there are many people who are naturally graduating towards DVD. Many of these are relatively new to the camcorder world having simply skipped the whole tape era. Others prefer the ease of recording onto a disc and wirelessly slipping it into a DVD player. Either way, DVD is slowly edging its way into the foreground and becoming increasingly competitively priced. 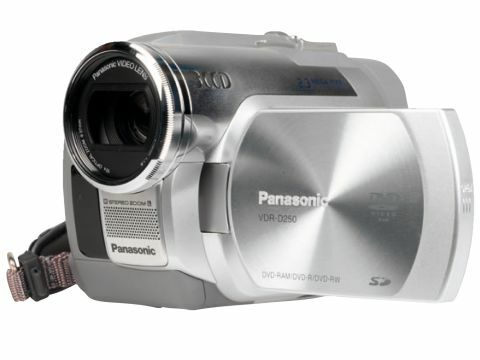 Panasonic's VDR-D250 is not the company's cheapest DVD recorder but offers a reasonable price and a generous clutch of features. This chunky little model is easy enough to hold onto, though it fits the hand more like a brick than a silk glove. All rearward features are within easy reach of your thumb and index finger. Up top, next to a colour viewfinder that retracts but doesn't rise, is an accessory shoe for an external light or microphone. Sockets besides the mic input include USB from which you send stills and video to a computer and an (S-) AV socket that lets you hook up an analogue connection to your TV, VCR or DVD deck. Menus are easy to negotiate using the Mode dial's joystick. This also calls up a series of menus that appear onscreen including manual focus although it's a rather basic version, which uses the joystick to focus and is best used only where the auto version is struggling to focus on what you want. Your £500 buys a good clutch of higher-end features. These include manual functions covering white balance, shutter speed, focus and exposure. You also get camcorder function staples like Backlight Compensation, Fade and Tele-macro mode. Wind mode, and an electronic image stabiliser are also regulars while a self-timer accompanies the stills function so you can take shots of yourself while lovingly gazing at your reflection in the reversed LCD screen if you so wish. Video shots use half of the 800k pixels available on each of the three chips in 4:3 ratio with slightly less for widescreen. Stills are available in various sizes with the largest being 1760 x 1320 pixels - this is in the regular 4:3 mode. Performance Video stability is admirably steady in all shooting circumstances. The difference in quality between the highest quality shooting mode, XP, and SP and LP, was negligible. Colours were recorded accurately, indoors or out, and even in the Low Light mode though the 0Lux version didn't match the sales hype. Otherwise, there was little dot crawl on straight lines. Even distant subjects appeared sharp and unwavering with minimal grain and the cam was excellent picking out the detail on a piece of wood decking and the deep, dark lines beneath our eyes - Tele-macro mode also impressed. Still shots were good at the top quality setting and, in the right conditions, made for very printable pictures, though they will be best used as stills within your video footage. You'll be hard pressed finding many DVD recorders for this price and there's little about the VDR-D250 that seems compromised. Performance is strong and there's nothing drastic left off the feature list with most functions working reasonably effectively. While it's worth auditioning rivals in the price range, you won't find much better value for money.